Ping pong is one of the best ways for people to spend their free time with friends and families. It is a great way to spend a rainy day indoors or just a hot day outdoors. If you happen to have a tennis table, you have a game in your home that brings family and friends together. 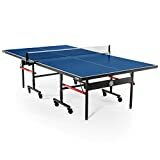 These ping pong tables are a great addition whether you’re looking to put in your basement, garage, backyard or the common area. 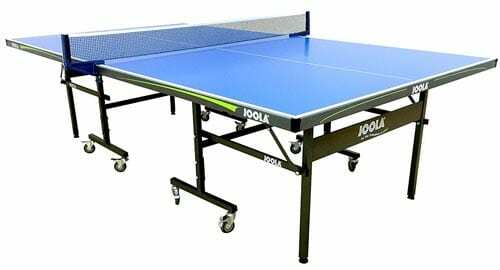 You need to consider several factors before choosing the best ping pong tables as the market is filled with varieties. First, you need to decide between a rollaway table and a stationary table with each coming with its pros and cons. Stationary tables are great when you need more stability while rollaway tables make it easier for you to move the table. If you go to a rollaway table, then the wheels ought to be large to move the table with ease. Some tables offer you a playback mode where you can practice alone. 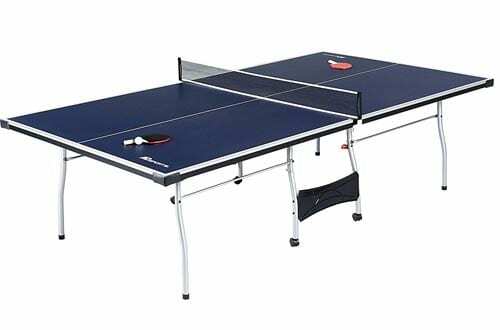 With the above considerations in mind, we have selected some of the best ping pong tables currently and reviewed them helping you with your selection. Read on and choose one from the list that best suits your ping pong needs. 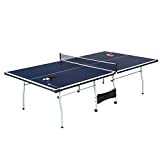 The MD sports gives you an eight-piece comprising of a tournament size table, two paddles, two posts, two ping pong balls and a removable net to get you playing right away. The design of the table is space saving allowing you to set it in the garage or room with ease. 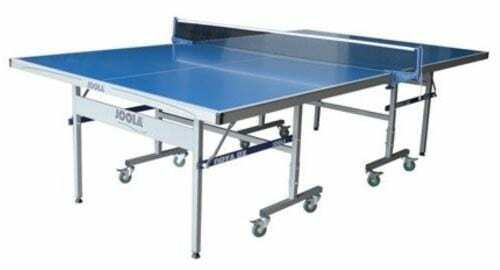 The table top is 15mm thick which is resilient to give the balls optimal bounces. It is a very sturdy table that is further supported by the 1 1/8 inches apron table. You have everything to start enjoying your ping pong game right away. The STIGA table is one of the best that meets competition level standards and ideal for your home or office. It is a great choice that comes 95% pre-assembled giving users an easy time setting it up. It is a rollaway table that gives users effortless movement whenever they want to change the location of the table. The table gives users excellent playability with a 5/8-inch top that has a smooth roller coat finish. The net is easy to attach and remove from any standard table. 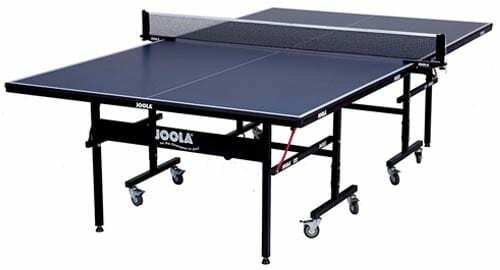 If you’re looking for a tournament quality table in the comfort of your home, then the JOOLA table is exactly what you need. It comes with the nine by five standard foot regulation size for indoor tables and perfectly sets up in your basement or garage. 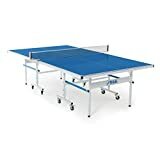 The table is nicely made in the USA by the Official US Open brands and comes 95% assembled. It is a quick 10-minute setup, and you’re into your game. 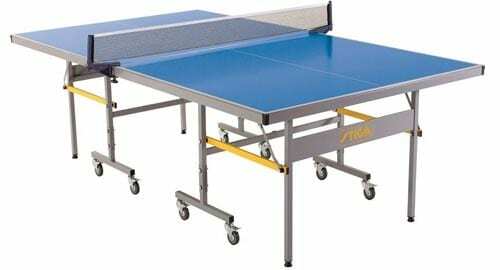 The top of the table is a medium density fiber that gives consistent ball bounce. The large wheels enable faster mobility and storage. This is another great piece from JOOLA with corner ball holders for players to easily place their ball and get them with ease. You don’t have to stuff your pocket with the balls but instead the ball holders that have the capacity to hold up to 3 40mm balls. It is a rollaway table with large wheels for easy transport. The two tables can easily be folded, and the wheels locked making the table quite easy to transport. 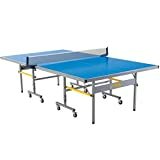 This is a nice stationary ping pong table that can also be used separately as a multipurpose table. The table stays firmly on the ground when setup is giving users nice play and consistent ball bounces. The table folds halfway and can easily be stored even in a closet. This is by far the best table when working on limited space giving you the ability to regulate the height. 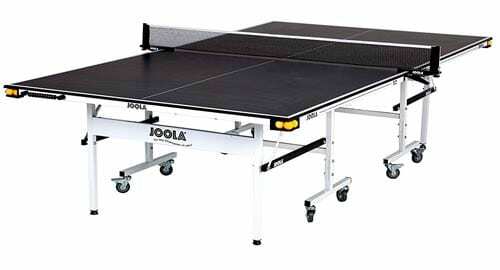 The table comes with a JOOLA net and posts letting you start to play right away. The XTR STIGA is another durable set one that comes with 95% pre-assembled for an easy 10-minute setup. Just get it out of the box, and you will be enjoying your game in the next ten minutes. 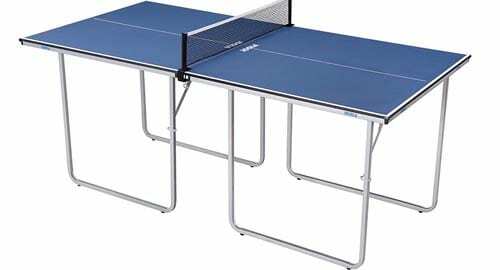 The table is very durable and ideal for outdoor ping pong games. You can easily set it on the patio or garage and enjoy your ping pong game there. The table is designed to withstand the harsh outdoor elements and serve you for years. When not in use, the table effortlessly folds into an ultra-compact design for easy transport and storage. This is an all-weatherproof table that has been specifically engineered using the composite aluminum plastic tops to enable it to withstand those harsh elements outside. The table resists rust and will serve you well even in a moisture environment. It is a sturdy, durable and strong table that is supported by heavy metal construction. There are an undercarriage and a trolley system with wheels for easy transport. The wheels can be locked when playing to help give the table more stability. 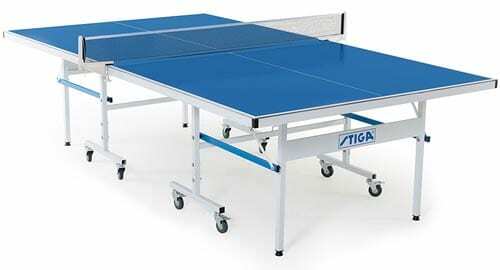 The table further boasts of the anti-tilting action that enhances stability. The table does fold into playback position when playing alone. The table is durable and rust resistance is serving you well outdoors. The JOOLA NOVA DX is an all-weather recreational table with an aluminum composite top that is resistant to rust. The table further comes with a large powder coated undercarriage to withstand the harsh elements outside. It has a two-piece table with wheels and one that folds up for playback and easy storage. The feet of the table can easily be adjusted as you level it up for balanced play. The table comes with an easy to assemble net included. The Harvil 9 is a good table that gives users good value for their money. The table comes with a complete set of all the required accessories to start playing free of charge. 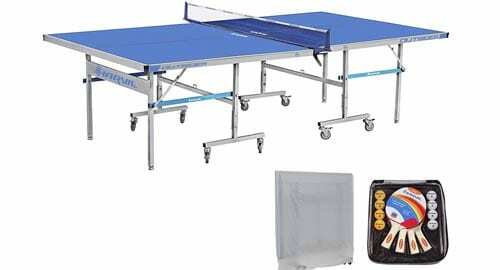 With the table already ordered, buyers also get eight balls, four rackets, net posts and a table tennis net. This is everything you need for ping-pong match right away. The table is quite sturdy and portable making it easy to transport. The wheels can easily be locked and unlocked giving the table the required stability. The top is aluminum composite while the frames are steel and powder coated. The JOOLA two-piece table is our number one pick this year with several amazing features that make it at a bargain. The table can easily be folded for playback mode or easy storage. You just need to fold it into two, and you’re good to store it. The feet of the table can easily be adjusted to conform to any terrain. 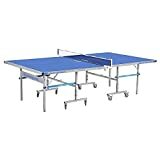 The double anti-tilting device and lockable wheels ensure the table stays in place and doesn’t move an inch when playing. 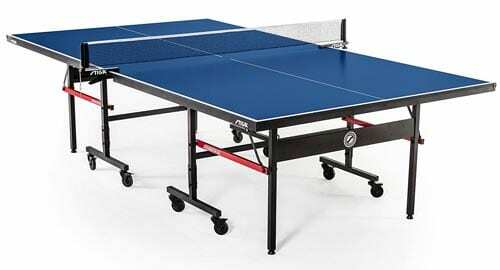 The table takes just a 15-minute assembly time, and one can easily start enjoying their ping-pong game. The feet of the table can easily be adjusted to conform to any terrain.